When most of your cooking / baking takes place on the weekends, which mine always do, anything you can do to make it easier goes a long way towards motivation. So this is something I learned from my mom. 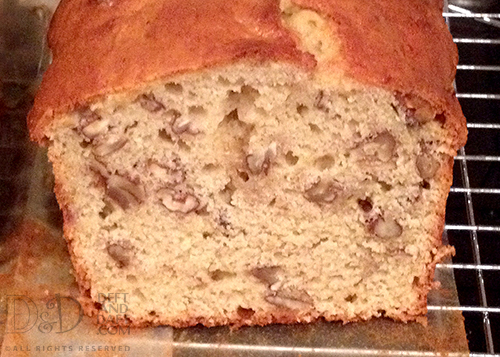 Ever Christmas my mom would make loaves and loaves of banana nut bread – it was like an assembly line. She was only slightly famous for her banana nut bread. Everyone wanted to be on the list. It wasn’t Christmas without her banana nut bread and I still make it every year since I finally got it right. Lord, that took a few years because the temperature has to change during the baking process, but I never had the timing or the temperature. Thanks mom. Can’t really blame her, I think this recipe was in her blood in a certain way. Once I figured it out, I would take it to Fred and he was happy. And it is just something I need at Christmas, but sometimes I make it in the summer because it has been six months since I’ve had it last. Guess that means it is time to make one this summer. Okay, back to making baking easier – my mom would always prep her dry ingredients ahead of time. Then all you had to do the day baking is get your butter and eggs out and it is super quick to mix everything up and boom! you are done. So by Thursday night I like to have my plans for the weekend baking finalized and then measure out all my dry ingredients and put them in zip top bags to make the weekend baking easier. And once it is easier bake, it makes motivation happen. To be honest this also makes weeknight baking, when I’m in the mood, easier to just put something together to make me, The Boy, and the test kitchen happy. I think my office and students would prefer to be called my test kitchen rather than my guinea pigs. But I also want my friends to challenge me to try new things. So this is what I do on a Thursday night … get ready for my baking weekend. Yep. It really works and makes life so much easier. Thanks mom! My mom always made Banana Nut Bread for Christmas – kind of an assembly-line thing because so many people expected it – no really lots of people – including me. Thankfully, I did get the recipe from her, but never made until after she died. It’s an odd kind of connection because when I smell it and taste it, it’s like nothing has changed. But I know it has. I make it every Christmas and also anytime when I go to see my Dad because no one else makes it. I do think he enjoys it, but I wonder if it’s bittersweet for him because it’s not for me. It really makes me happy. It is one of those recipes that I thought to keep to myself, but I think sharing it is a better thing to do. Funny thing – I don’t like or eat bananas (I so want to say this like a Minion – totally) – but I love this bread. Strange? Totally, but there it is. And here’s the big secret – what you have to do is this: bake the bread – stash half in the fridge and the other half in the freezer for later (in foil of course) and then when you’re ready for some breakfast, turn the broiler on and toast the bread till the edges are crunchy and the middle is toasted and then the best part – slather it with salted butter. Amazing. That is how my mom served it on Christmas morning. Every Christmas morning. And I still do that, but sometimes in June it is so amazing because it’s been about six months since Christmas and you have all the ingredients handy with the exception (for me) of bananas. This month, I made some for my dad since we went over last week and since I had to slice the loaf in half, I didn’t think anyone would notice if one slice went missing. Damn, it was so good. Oh, and recipe note – the bananas need to be really ripe (read: pretty much brown all over). Easy, buy bananas and just wait. Usually it takes about 3 regular-sized bananas. The only problem I have is the temperature and time, which I have kept futzing with but I have still not come up with one that is perfect. So, depending on your oven you may just have to mess with this part – I do. But it’s worth it – no, really, it is. Still haven’t figured it all out yet, but when I do – I just might be a little bored. meh. Grease and line a 9 x 5″ loaf pan with wax paper and spray again with baking spray. Sift the flour with the baking powder, salt and baking soda – typically, I do this on a piece of waxed paper. In the stand mixer, blend the butter and sugar together. Then add the eggs, one at a time until blended. Add the mashed bananas and blend until combined. Mix in dry ingredients. Add pecans and mix well. * totally not working for me, but I’ll add all my notes below. * Notes: So my oven is calibrated correctly, and here’s the closest that I’ve come, but I would still advise that you check with a skewer. 300 degrees for one hour, than 340 degrees for about 25 minutes. This is the best I’ve gotten and it works pretty well.